Recently I spent time with my art classes studying the work of artist Georgia O’Keeffe. I really admire her work and have been inspired by her spirit. I wanted to share that feeling with my students. I know this type of lesson could very easily be used with homeschool students. So I thought I would share the experience. I created a power point presentation showing my students the work of Georgia O’Keeffe. As I showed the presentation, I told them some interesting bits of information about her work, her life, and also showed a short video that I found on You Tube. Here is a link to that video: Georgia in New Mexico at age 92. The next day the students were told to sit in the same seat. This time they were asked to begin adding shading and detail to their drawing. The background cloth was not to be included. I wanted the skulls or bones to appear to be floating. The students had to look closely to see all the cracks and crevices in the bones. They worked all class period adding the detail. Their drawings were starting to take shape. I was pleased with their progress. As the students worked on their drawings, I also worked on one a short time in each class. Taking ten minutes here and ten minutes there, I was able to complete a sketch. I feel that it is important for me as an art teacher to model the behavior I expect from them. I also wanted to have a drawing I could show as an example of what I wanted them to create. Having a sketch to show for the third day was important. I wanted the students to understand fully. 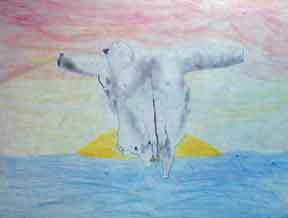 On the third day I asked them to use colored pencil to create an imaginary landscape behind their bone drawing in the style of Georgia O’Keeffe. They were given a choice of doing a sky only or adding a landscape at the bottom of the page. 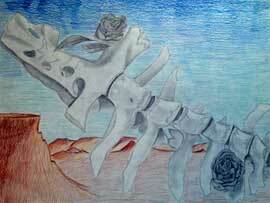 So after school the second day I quickly created a colored pencil sky and desert scene as an example. I also collected numerous magazine photographs of skies, mountains, and deserts that the students could use if they wished. My Example for the Class. So the next day when the students came in I showed them my creation with background and told them to create one of their own. So there was very little instruction. I did go around the room giving advice to students as they asked about ideas of how to complete the assignment. I reminded the class of the work of Georgia O’Keeffe and showed them her work from a book I carried around with me in order to inspire any students that seemed to be confused. The class ran well and the work the students created really turned out great. I actually ended up giving the students a fourth day to work on their drawings because of the size of their work. Most students needed that extra day to finish. 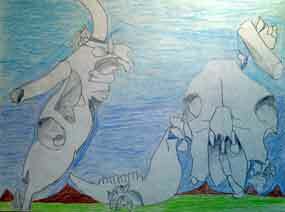 I was very impressed and felt that the students really had been inspired by Georgia O’Keeffe. I certainly was when I created this lesson. I am including some of the student work for you to see. Day One: The students created a contour sketch of the chosen skull or bone. Day Two: The students added shading and detail in the bone drawing without adding any background. 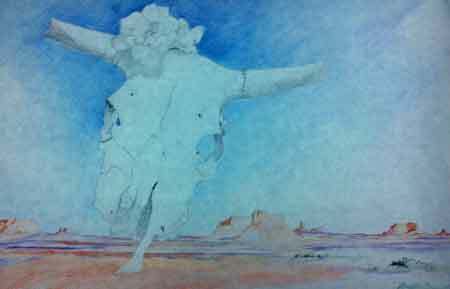 Day Three and Four: The students used colored pencil to create a sky and desert background behind the bones. Homeschool parents can use this same lesson using Georgia O’Keeffe as an artist to study. You can find many images of her work, save them to your computer and show them to your children. 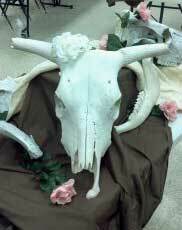 I choose to use her bone paintings as inspiration but you could also use her flowers. You may not have a collection of skulls or bones but you can find photographs online or in books. I hope this art lesson will give home school parents some ideas they can incorporate in their homeschooling. Have fun!